"Which oils are good for curly human hair extensions?" Instead of a list of "good" oils for curly human hair extensions, it might be more helpful to outline why certain oils are good for human hair (whether extensions, wig or growth). This way you'll know why some are considered good and others not so much as opposed to just knowing which to use and which to avoid. The best oils to use on your curly human hair extensions (whether pre-glued, hair weave, clip in hair extensions or micro ring hair extensions) are those that come from plants like almond, argan, avocado, castor, cocoa, coconut, jojoba, olive, rosehip and shea. The better versions are those that haven't been refined to the point that the majority of the goodness in the oils have been removed (a bit like how extra virgin olive oil is better than refined olive oil) as these provide the highest levels of nutrients for the hair. The betterish oils are those that penetrate the hair shaft and the oil that does this betterest than the rest is coconut oil. 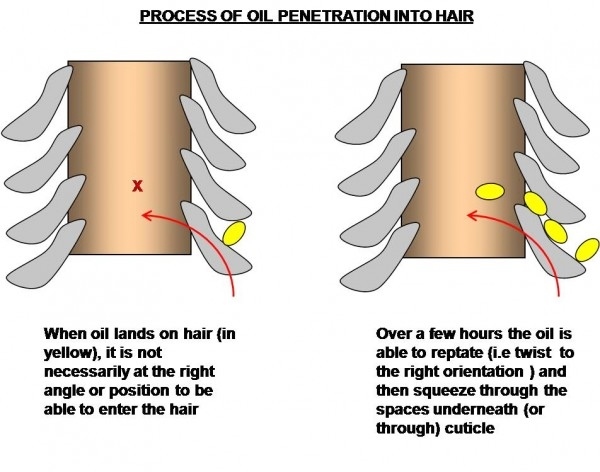 Why is oil penetration important for human hair extensions and wigs? "What's the best time to use hair oils on curly human hair extensions?" Curly human hair extensions (and curly human hair wigs) have usually been chemically processed to produce the curly texture, which means that the structure of the hair has been altered (weakened). This means that human hair extension have a tendency to dry out and oils that get through the cuticle layer help lubricate the hair internally and if using something like coconut oil, will also replace lost proteins to help strengthen the hair. Due to the various ways that oils help nourish human hair and improve its appearance, they can be used as part of daily styling, washing and conditioning. Oils can be used to smooth frizz as part of your daily styling with the added bonus of making the hair shine. If you choose coconut oil, you'll get a lot for your money and you won't need that much for daily styling. Something like argan oil - which contains vitamin E - is more expensive, but it can be used sparingly. Applying oil to curly hair extensions before washing can help prevent the hair extensions from dehydrating and losing proteins during the washing process. In addition to this, as oils lubricate they can be used prior to washing to assist with detangling (the hair is slippery so easier to detangle the hair curly hair extensions). Apply as much oil as required to your curly hair extensions before washing and allow it to sit on the hair for 2 - 12 hours. Pre-wash oiling will also create a buffer against any harsh ingredients in the shampoo like SLS or SLeS. When applied to damp hair, oils help seal moisture into the hair. Using oils in this way doesn't replace the requirement to moisturizer curly hair extensions (as oils aren't moisturizers, they lubricate and nourish), why not check out our guide to best way to moisturize curly hair extensions. Protein conditioners can actually dry out human hair (it's just what protein does to hair) so using a hair oils after deep conditioning (whilst the hair is still damp) will help seal moisture into the hair. The easiest way to do this is to apply a small amount of your chosen oil to the damp curly hair extensions and distribute it using a wide tooth comb. Using oils on curly hair extensions is an easy way to nourish the hair, preserve the curly texture and prolong the life of the hair. That's the canter through caring for curly human hair extensions with nourishing oils, but if you have more questions about hair extensions why not check out the Your Hair Extension Questions, Answered section or if you'd like to be first to read new guides and articles about wigs, hairpieces and hair extensions, join our blog - it's super easy to do and doesn't require any personal info!